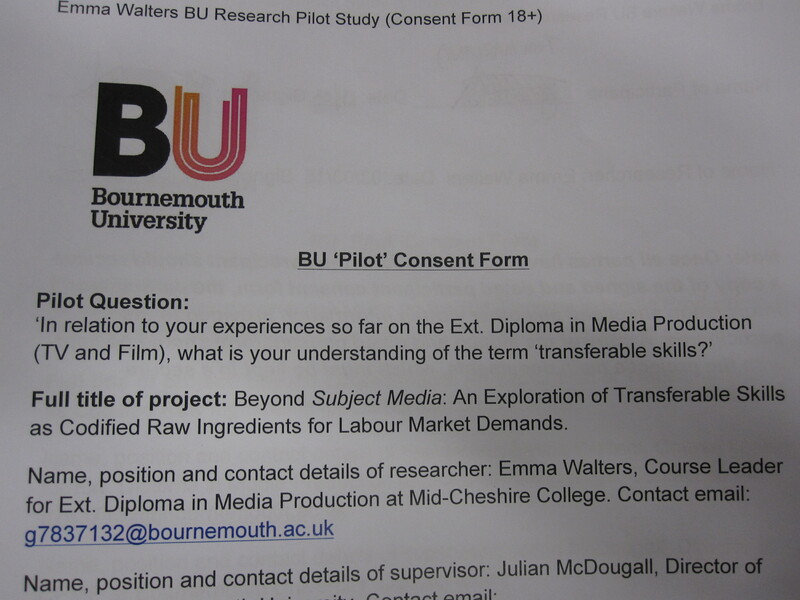 Still awaiting the green light from the BU Ethics panel as approval for my project is still pending. Once my project is approved and the pilot can begin, I will reflect here on the merits and challenges of using a mixed-method approach and emergent data outcomes. UPDATE: 9th March 2015 – BU Panel approved my project and associated paperwork including Consent & Assent Forms as well as Participation Information Sheets! 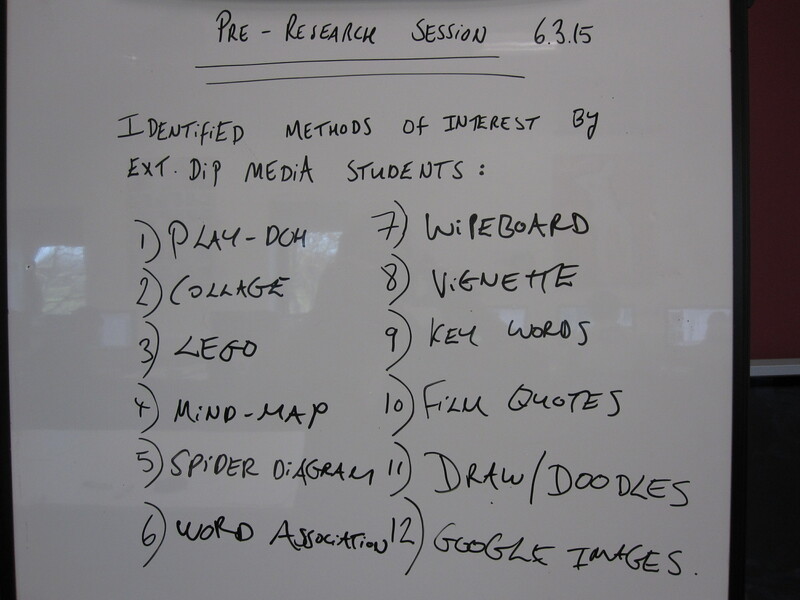 Pre-research (Session 1) designed to help potential participants identify a range of methods they might like to use (should they agree to participate) after showing them how Gauntlett works with Lego as an example. I screened this video (below) by Gauntlett to help participants think more broadly about what methods they might want to use should they agree to participate on the day. The result of which was the wipe board evidence above. Participants came up with 12 options – I simply collated their contributions based on a short discussion. From the list above participants then decided what method they wanted to try out the following week (in Session 2). Looked at data for the first time 16.03.15. 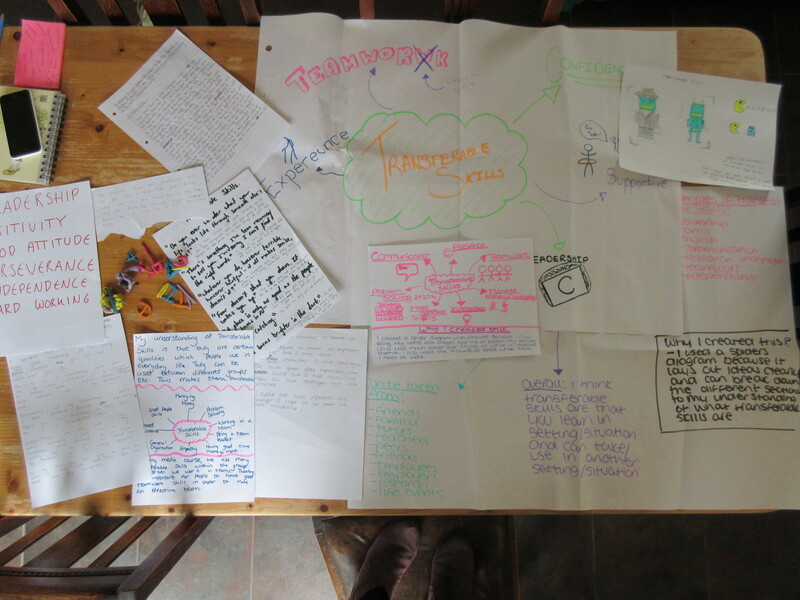 Spent the day labelling and clusterings documents for each participant. 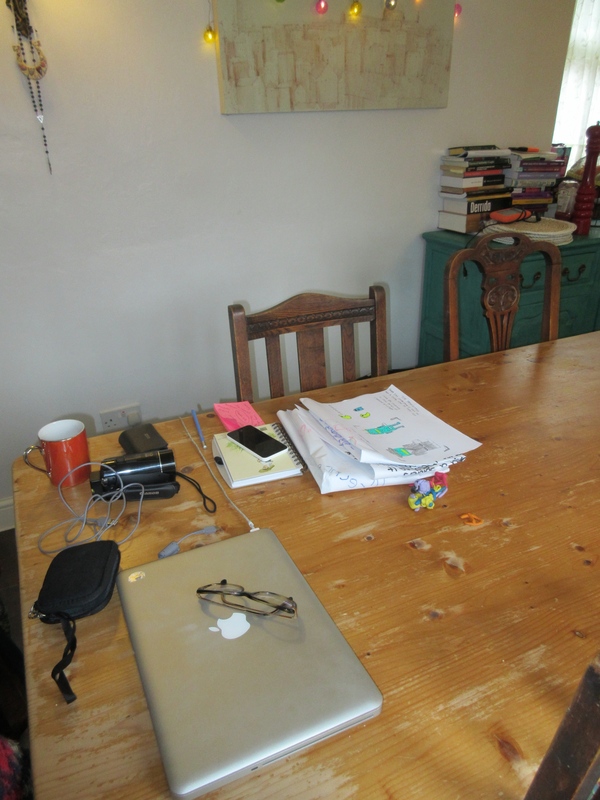 A few bits of evidence needed affirmation a few days later – a problem due to my absence as I wasn’t present to collate in an organised manner. 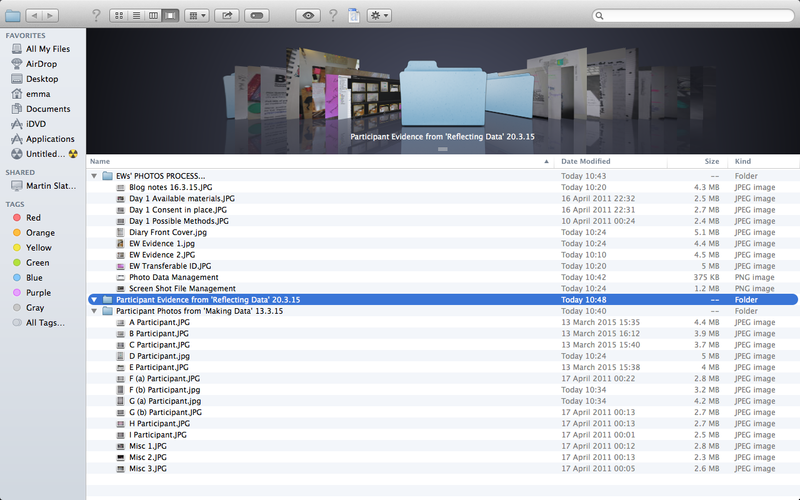 File management. 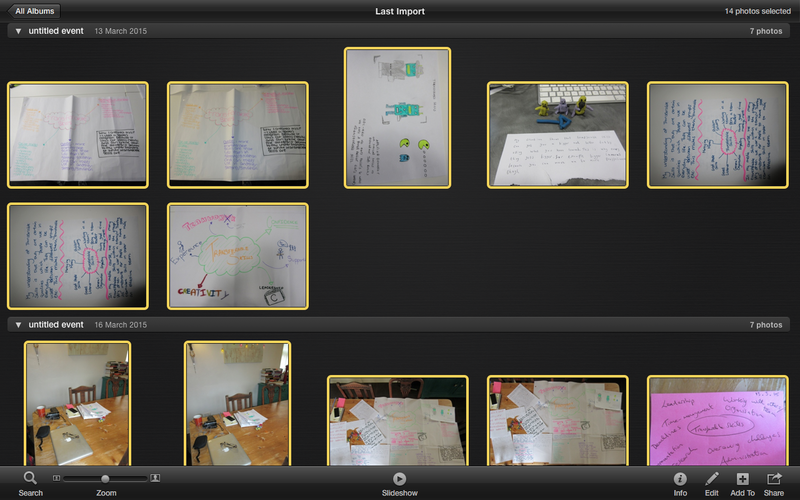 Identifying & labelling photographs found on camera (to begin data analysis stage). 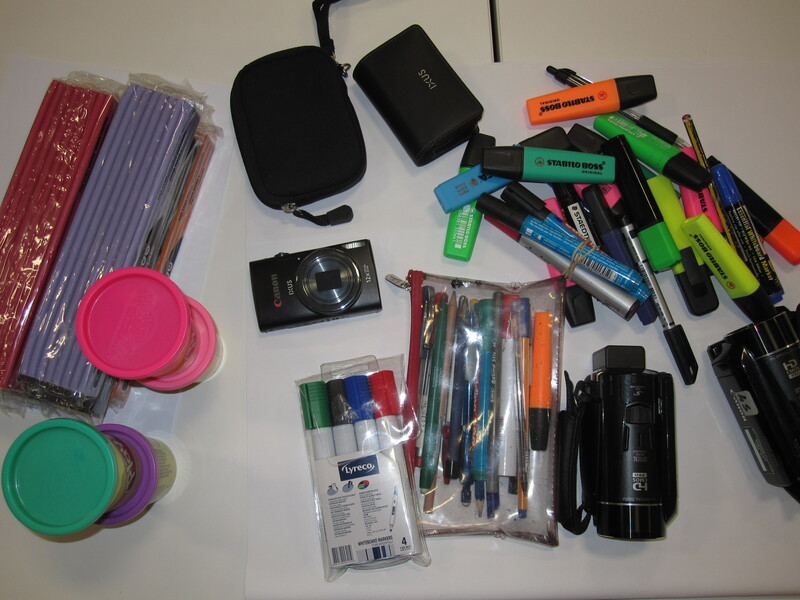 Today I looked at participant generated photographs of the artefacts produced for the first time (16.3.15) as I was not present during actual collection. Making sense of data retrieved and then transcribing written participant work in tabulated form for clarity.